Mensusa https://www.mensusa.com/articles/long-brown-leather-coat-attires-that-projects-your-fashion.html Long Brown Leather Coat- Attires That Projects Your Fashion Pursuits The long brown leather coat is an attiring option that suffices with multipurpose dressing needs. These coats accentuate your personality in a glorious and elegant style, that enable you to get to the center of attention. The long leather coats are delightful attiring options for the stylish men. These coats can wonderfully uphold your masculinity and get you to the attention of the people. The long brown leather coat is indeed the icing on the cake. The brown shade can wonderfully complement the appearance of the leather and as a result, you will look more graceful and elegant. 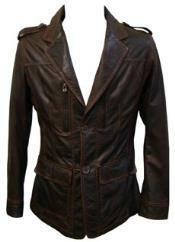 Hence, you can be assured that your appearance will get more accentuated in the brown leather coats. You can try the long brown leather coat in the formal, casual as well as the prom occasions. The attires will never ever a mismatch for either of these ambiances. The brown shade imparts flairs of gravity and sophistication and the leather reflects elegance and class. Combining these two aspects, you appear to be a man with a classy choice. The leather long coats are equally rich on the aspect of the fashion as well. It gives you a different appearance that the crowd who would be dressed in the usual fabrics. Hence, choosing the leather long coats comes advantageous in promoting your matured taste; it displays your strong fashion pursuits and gives you a completely different appearance, from the crowd of the men around you. The long leather coat is not only ravishing in the styling front, but it offers the optimum comfort. Constructed with the premium grades of commercial leather, these coats will make the winters, comfortable as well stylish for you. The market has the availability of lighter weight construction, that comes equally comfortable for the fall winter time. Keeping equilibrium between fashion and comfort, these coats enables you to appear confident and formidable. Hence, it stands obviously that your appearance will be appreciable. You will not face a dearth of options on these long coats, in the instances, you go out to buy one for you. You can expect to get inexhaustible options, based on the aspects of the design and the styling of the coats. Even, you can expect to get several lighter to darker shades of brown and hence, you can pick the one that matches your skin tone at its best. The brown long coats are simply fascinating in its appearance and projecting a polished, sophisticated and fashionable appearance, it will enable you to steal the show of the occasion that you attend. www.mensusa.com fetches you the most delightful collection of leather long coats. This store stocks the products from the established brands only, and hence, can always assure the qualitative aspects of the products that it sells. The store offers an unbeatable deal on the price.